Young Indian Officer in Green Turban. Mid century portrait painting by V. Elliott Ferguson, 1950. 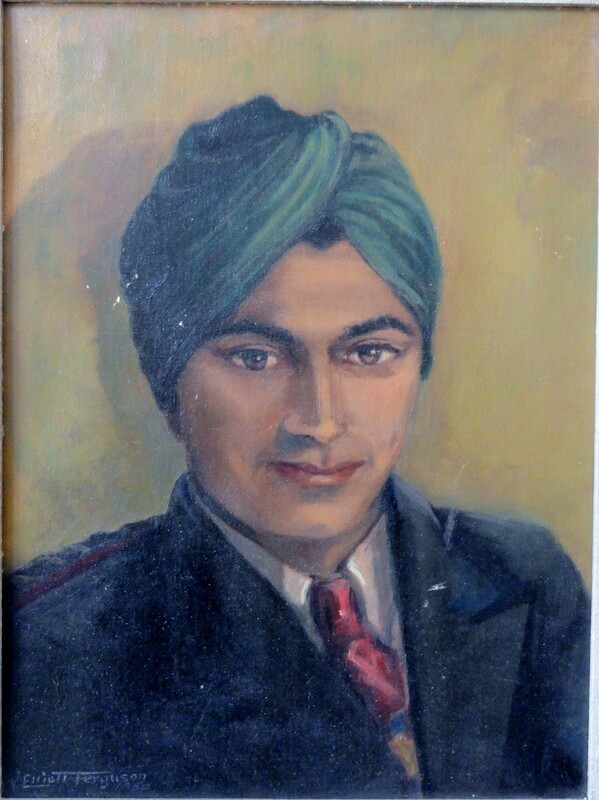 This is a medium-sized portrait oil painting by Canadian artist V. Elliott Ferguson (1900- xxxx) of a young and handsome Indian officer wearing a green turban. Painted in 1950. My guess is that V.Elliott Ferguson must have been stationed in the India/Pakistan region in the 1950’s, and knew this subject personally, since there seems to be an easy, friendly, at ease manner to the subject. Very well done painting with some small chipping condition issues in the young man’s turban, and in his lapel, that should be able to be fixed easily by a decent restorer. $350.00 + Free shipping in the USA.